I have fallen in love with several of the natural perfumes that I have formulated recently — from floral to sweet, to captivating warm and smokey. I am not a fan of geranium, but this perfume starts out with a strong floral scent that I love. This blend is composed of top and middle notes, with no base notes, so I am surprised at its lasting power. It dries down to a sweet floral that draws my nose straight to the spot where the perfume is applied…and then I describe it as heavenly. I love vetiver, and this perfume dries down so incredibly smokey — perfect. Cedarwood is also one of my soft spot scents. This bold blend takes me to a place that feels like home, very grounded and at peace. This perfume starts its journey on the skin with a rose and fennel type of overlay, soft and sweet. I adore patchouli, and this perfume dries down to a firm base filled with that love. It starts out with a grassy overlay that holds on dearly for most of the dry down. I use 15% essential oil in a perfume blend, and 4-8 percent in a cologne blend. Jojoba is a great oil to use as a carrier. It is non-staining and sustains the perfume very well. Liquid coconut oil is also a wonderful carrier oil. In a pinch, I use an inexpensive olive oil, which is light yellow in color – not green. A small bottle of this oil goes a long way, inexpensively, and it does not possess more than a hint (if at all) of the aroma of olives. Olive oil does stain clothing — so use caution. After blending a natural perfume, tightly cap the glass bottle and place it in a dark area where it can sit undisturbed for no less than several weeks. The oils will marry and mature while at rest. When you uncap the bottle, you will find that the oils have blossomed to a beautiful union unlike the day the perfume was formulated. Do you enjoy a relaxing warm bath? Several drops of these blends in a bath are spectacular. Add unscented mineral or sea salts to your bath water, and you truly have a soothing spa experience. 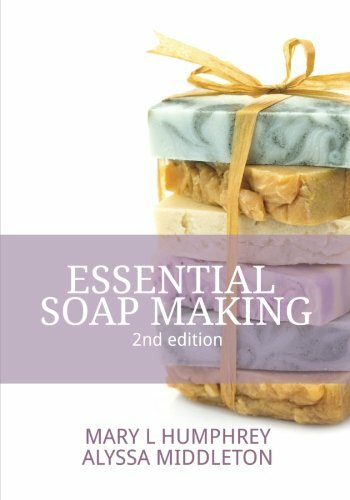 In our book, Advanced Soapmaking; Removing the Mystery, we devoted a chapter to natural scent blending. 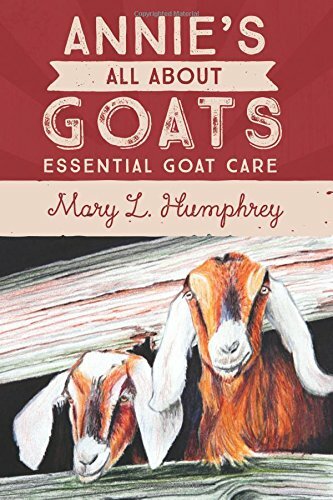 We also teach properties of many common essential oils in this volume. 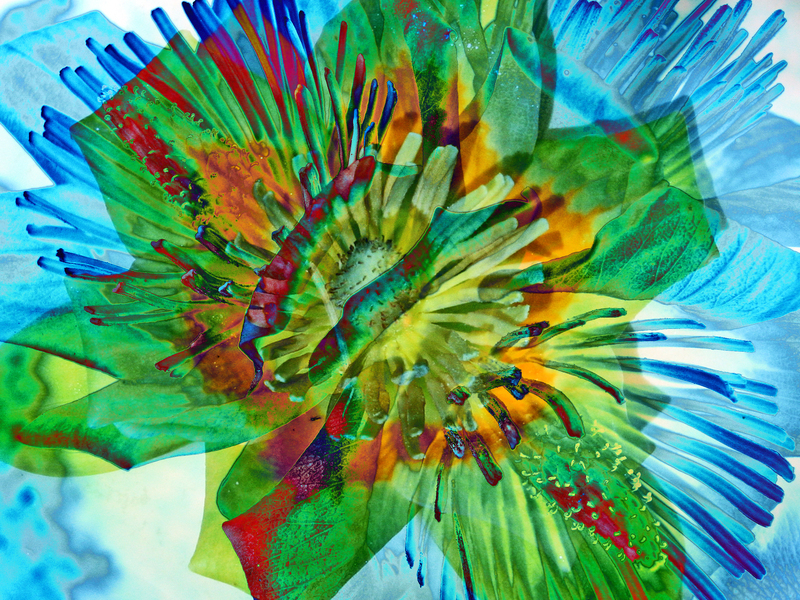 Don’t you just love experimenting? Like a child with a paint set creating beautiful paintings with stained glass-like colors, I had tiny essential oil bottles spread around the large piece of heavy cardboard I use as blotter paper for any spilled drops. Do you know how blissful a room smells with a blotter board hidden in a corner? Oh yeah! He actually smiles and loves hearing me tell him about my smell-good creations. 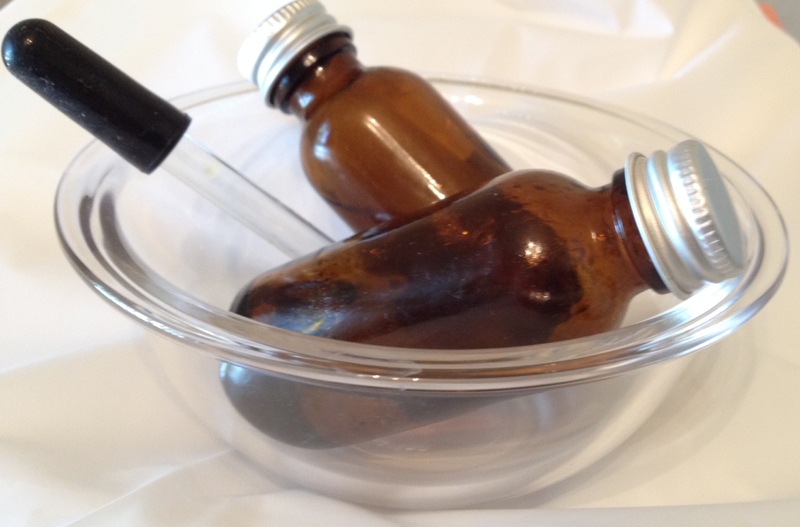 Two oils got special attention from me this time around, Champaka (Nag Champa) Absolute and Cocoa Absolute. I was stuck on Tuberose Absolute for so long – and still love it – but the Champaka has drawn me in. It smells green, floral, and deep. Soothing and uplifting. 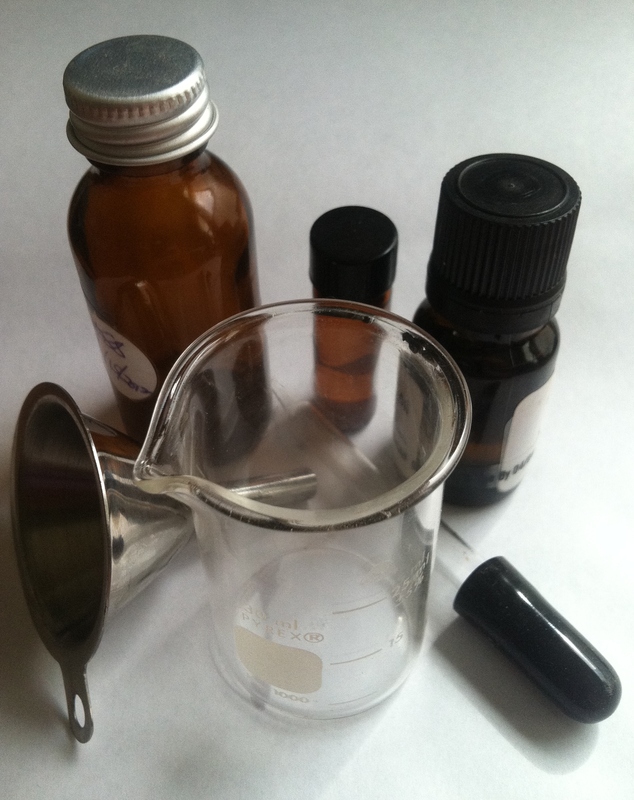 The Cocoa Absolute – no, I am not trying to create a “foodie perfume,” I am stuck on a patchouli, jasmine, cocoa blend, and currently have it topped off with spicy-ended essential oils. The cocoa is nearly undetectable. It adds a soft sweetness. 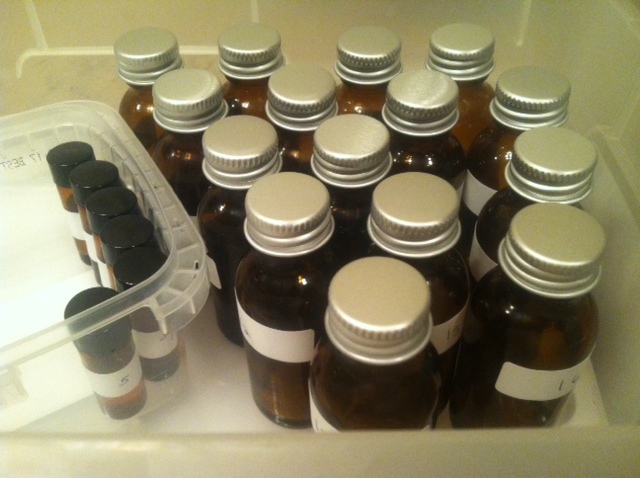 I made twenty-two bottles of test perfume, two for myself to use right away. One is a blend of chamomile and lavender for the nights when sleep is evasive. That never happens, right? The remaining bottle is a blend to satisfy my nose, something for me to wear, to keep me out of the shoe box full of test bottles for two weeks. I am also like a child that wants to stick her finger in the cake icing, just to try a sample! I kept smelling it even though I was not wearing it. It was not my lotion, nor my laundry detergent, and certainly not my shampoo. So, why was I smelling patchouli? Not that I minded it at all. A correctly proportioned perfume hits your olfactory system first with a pleasant top note, a short-lived, light or fresh, essence, or blend of essences. Pink grapefruit, for example, is one of my favorite top notes. As the top note dries, the middle or heart note is soon detected. A middle note lasts longer than the top note that first catches your attention. One of my favorite middle notes is (euphoric) jasmine grandiflora. 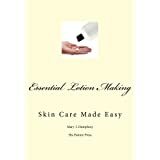 Last, but not least, the base note sticks with the blend, on the skin, for longer periods of time. Some base notes can be detected a day or two after they are applied. Base notes can hold a blend together, or can muck it up considerably when excess is used. Patchouli is a base note. Patchouli is an essential oil that many either love or hate. Patchouli, depending upon its strength in a blend, can be detected on the skin days after it is applied. A customer once said she helped nurse a sick friend back to health. Her friend adored blends that contained patchouli. The customer was not a fan of patchouli, not at all. After washing the friend’s clothing time and time again, the customer that hated patchouli still detected it. My story ends there, but with a “bingo!” I personally smell patchouli because I have worn it so many times, from our signature blend Patchouli Love (soap, body cream). My clothing obviously contains the remnants of patchouli, picked up from the products, and from my own skin. In my case, I find patchouli to be grounding, so the remnants are a very good thing. Essential oils are such a blessing, in my opinion. Thumbs up to nature for providing us with the uplifting top notes, the enchantment of the middle notes, and the seemingly ever-lasting base notes, with much acclamation to how the oils are perceived so differently by each individual! Tuberose (Polianthes tuberosa) absolute, if you have not smelled it, is sweet, somewhat spicy, rich and tenacious. I have totally fallen in love with Tuberose absolute. Hands down. 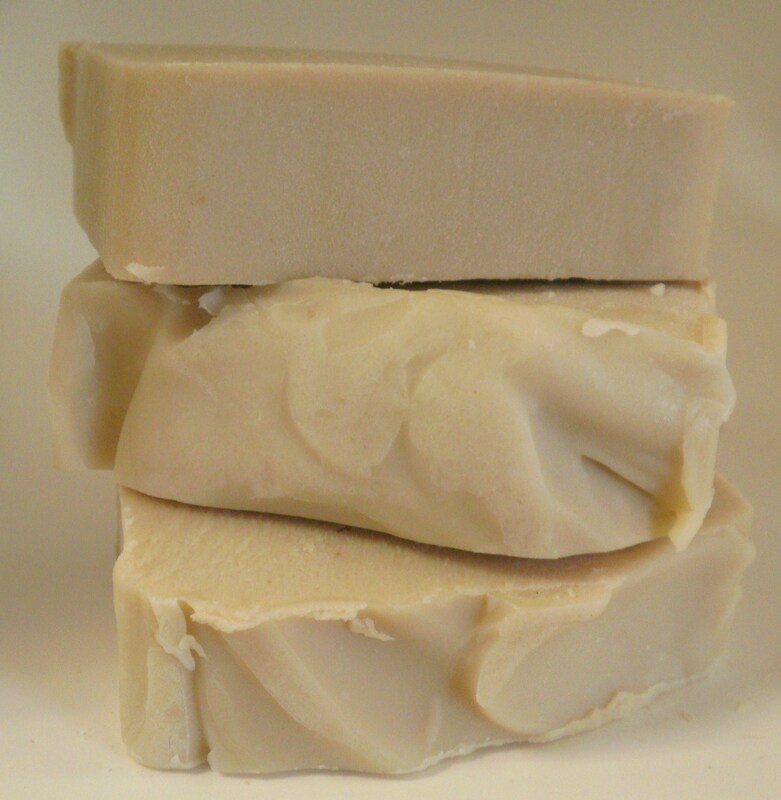 I have been working quite a bit with it, blending with Ylang Ylang and Jasmine. I could nearly drop Tuberose into a base oil and call it a perfume by itself, but I won’t. My goal is to include Tuberose in a blend that I will call my signature scent. These things take time, patience and practice. I am working on all of the above. A little background: Tuberose is generally not recommended for aromatherapy use, but is recommended as an exotic addition to natural perfume. It is considered a heart (middle) note in a perfume blend. 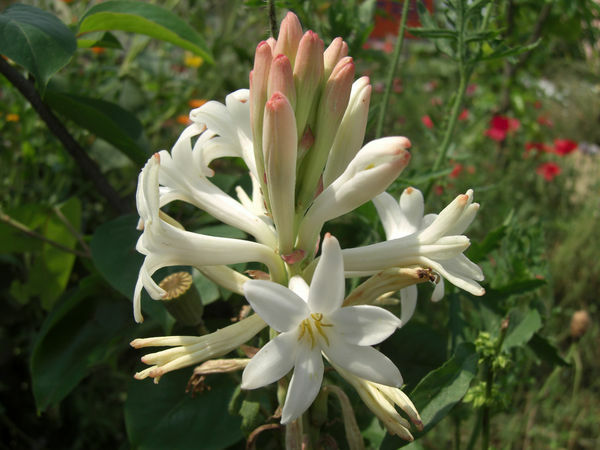 Tuberose is a native of Central America, where it is found growing wild. Oh…how I would love that! I haven’t researched this, but it is also my understanding that tuberose is used in some confectionaries and beverages. I am in love with Lavender and Chamomile tea, I may have to check into the prospect of Tuberose too.